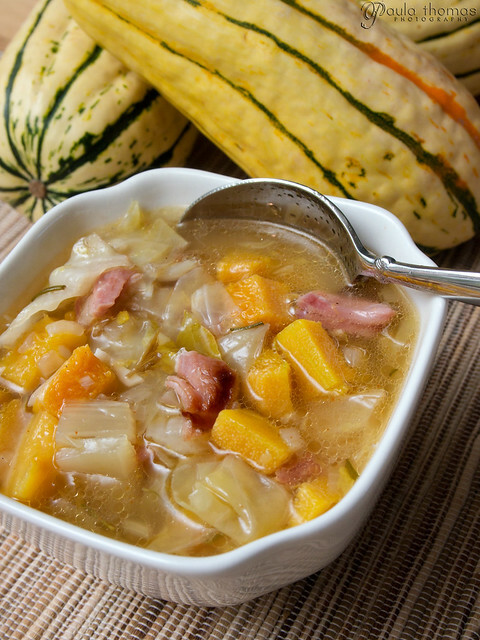 Summer is over and fall is here, it's the perfect time of the year for soup. I usually make a squash soup every fall, typically a butternut squash soup. I honestly was never very knowledgeable about winter squashes. Pumpkin and butternut are the only two I have any experience cooking with, but there are so many other good ones that I never thought about using. I've used a couple of new ones this year and learning the names of some of the winter squashes that I've seen every year but never knew their names. I used spaghetti squash for my fake pumpkin pie and used delicata, the long one with green stripes, for this soup recipe. I'm on a low carb/low sugar diet which is why I have been trying out other squashes. The two squashes I normally use, butternut and pumpkin, are both high in carbs while delicata and spaghetti squash are lower. Some other popular winter squashes are acorn, ambercup, autumn cup, banana, buttercup, carnival, golden nugget, hubbard, kabocha, sweet dumpling and turban. In addition to all those there are over a dozen different varieties of pumpkins. Allaboutpumpkins.com has a pretty comprehensive list of the different varieties of winter squashes and pumpkins. I haven't done my research yet to determine the ones that have the least amount of carbs. In general winter squashes have more carbs than summer squash. I'm pretty thrilled with how it turned out and it didn't take as long as I thought it would. It took about 2 hours of cooking and the prep work took a while, especially for the squash. I wasn't sure what the best way to peel a delicata squash was but I ended up using a potato peeler which seemed to work out pretty well. The squash was a lot harder inside than I thought it would be, making spooning out the seeds a little more difficult. The squash turned out pretty mushy, I was hoping for a little more texture in them so I might recommend adding the squash maybe 15 minutes later so it cooks for 45 mins instead of 60, I updated that in the recipe below. Heat bacon grease in a large stock pot over medium high heat. Add celery and onions and cook about 10 minutes. Add the ham shank/hock. Add cabbage, garlic, bay leaves, pepper, salt and cayenne. Stir and cook until cabbage is slightly wilted, about 5 minutes. Add chicken stock and desired amount of water. Bring to a boil and simmer uncovered for 45 minutes. Add the squash, cover and simmer 45 more minutes. 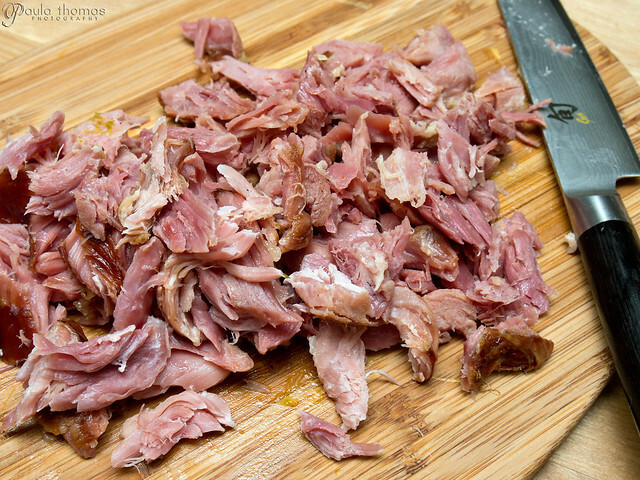 Remove the ham from the pot and let cool for a few minutes. Remove bay leaves from the pot, if you can find them. 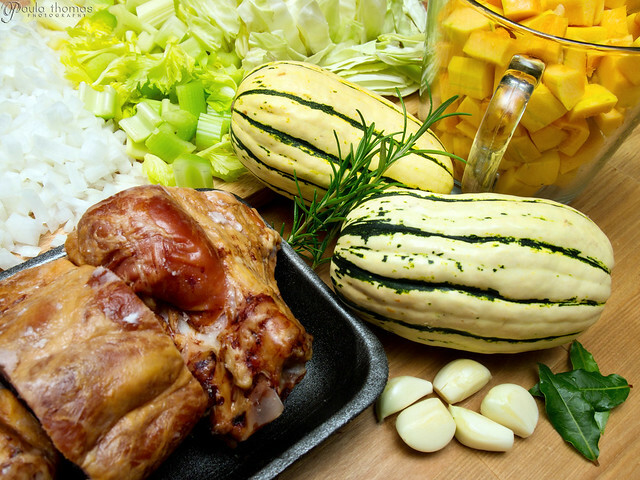 Remove the meat from the bone and chop into small bite sized pieces, add back to the pot and serve.